This week Smart Girls hosts Tracy-Cooper Posey! TRACY: Such an easy question! I discovered Lord of the Rings by JRR Tolkein when I was very young, although the very next year, I found Dune by Frank Herbert, and that same year, Star Wars came out, and I fell in love with science fiction. I’ve been reading it ever since, including most of the classic hard SF by authors like Asimov, Herbert, Heinlein. TRACY: I started writing SFR accidentally: I was so in love with Star Wars and Han Solo, that I wrote the unofficial sequel, years before the real one came into the theatres. Han Solo’s “I know” made it a lock – I was forever in love with SF, particular the stories with romantic elements. But while I have published over fifty romances, it is only this year I have finally had the courage to write SFR. I’ve previously released a futuristic time-travel series, and that was a warm-up for the real thing. TRACY: Preferably, a heroine with a backbone, who can think for herself, and can survive without a man in her life if she really has to. It makes her acceptance of love all that much more important. Heroes: <sigh> I like ‘em all ways, but I still have a soft spot for the omega hero – the politically correct alpha that gets his knees taken out from under him by love. There’s nothing better than seeing that supreme moment of vulnerability in an otherwise controlled hero…. TRACY: There is usually a single scene and sometime even a single moment that is part of the story that I will “write up to”. It drives the story and gives it shape, as I plot to include that scene or moment. I don’t know where those moments come from. As I’m starting to build a story, they’ll often just pop into my head – usually when I’m not plotting. I’ll be falling asleep, or doing anything else, and I’ll think of the coolest scene or moment…and that’s when the book draws its first breath. 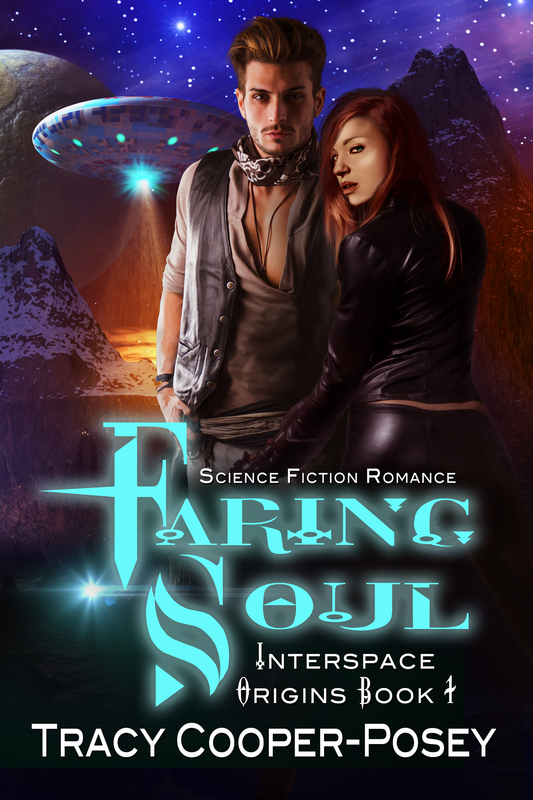 TRACY: Faring Soul is book 1 of The Interspace Origins series. It is my second SFR title and is officially released on Friday, although it is currently available for pre-order everywhere. SGLSF: If you were trapped in a fandom universe, where would if be and why? TRACY: I had to really think about this one. Narrowing it down to one is difficult, but I think I would pick Robert Heinlein’s future – the one where Lazarus Long and his family live. I don’t think I would consider myself “trapped” if I found myself there, either! TRACY: Traveling backwards, I would go to Rome at the height of the Republic. It’s a civilization that has informed nearly every aspect of our current society, including our language. It would be great to see that world. And I would like to go forward – not far, just a thousand years or so. If the world has changed so much in 2,000 years that Rome is considered “ancient”, then in another 2,000 years, where will we be? I’d want to know…. 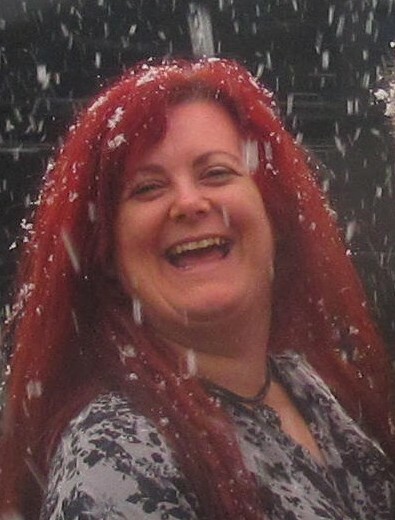 I absolutely love author Tracy Cooper-Posey’s writing., She has a wonderful imagination and knows how to put all together for a wonderful read. I’m also a big scifi fan and am so excited that she has written Faring Soul and finally gotten into this genre. Another 5 star book. We at SGLSFR are very glad she’s writing SFR now too! Wow, thanks, D! Yes, I think I’ll be writing a lot more SFR — had a lot of fun with this one. No, I don’t think I would, either. Lead poisoning in their water, and the women didn’t even get their own names — just nicknames (which shows how highly females were rated — soldiers named their horses!). Just a visit, though, would be fabulous. I am amazed by your writing career-wow! Glad you allow SFR to be blessed with your talents.